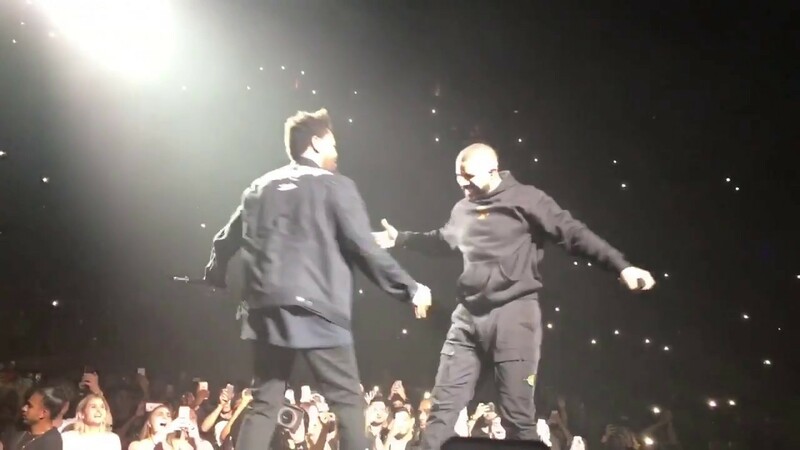 The Weeknd surprised fans by bringing out Drake at his show in Toronto on Friday night (26th May). Performing to his hometown crowd at Air Canada Centre, the 'False Alarm' singer welcomed fellow Canadian Drizzy to the stage during the encore of the Legend of the Fall Tour show. Drake performed 'Jumpman', 'Gyalchester' and 'Fake Love' during the finale of The Weeknd's during his 23-song set. Other appearances during the show included Rae Sremmurd, Belly, and 6lack. Meanwhile, The Weeknd, real name Abel Tesfaye, recently featured in the music video for his Lana Del Rey collaboration 'Lust For Life'. The Starboy's tour is set to wrap up on 22nd July in Paris, France.